Arsenicum album is among the most interesting homeopathic remedies. You see, it is made from the gray chemical, mineral, and heavy metal arsenic, which is considered quite poisonous in high amounts. Homeopathic arsenicum album is, therefore, a perfect example of the homeopathic principle “like cures like.” Although arsenic has potential harmful effects, after it is highly diluted, it can even treat arsenic poisoning. Arsenicum album is derived from arsenic trioxide—also called arsenopyrite, arsenic oxide, arsenious acid, or simply arsenic. When it is all said and done, there is virtually no trace of the actual chemical. What remains from the creation is a highly diluted homeopathic remedy that could treat numerous health conditions, including arsenic poisoning and toxicity. It also effectively treats respiratory illness, digestive disorders, anxiety and fear, headaches, food poisoning, eye inflammation, eczema, psoriasis, burns, and more. Read on to learn about homeopathic arsenicum album, and its many health benefits and uses. Arsenic can be found naturally in water, and it is often a byproduct in certain foods. In the past, arsenic was also used to make wallpaper and flypaper, which sometimes lead to accidental poisoning. For instance, Napoleon’s death was attributed to arsenic used to color his wallpaper, which may have formed a deadly gas in damp and moldy conditions. That being said, the facts on arsenic aren’t all bad. 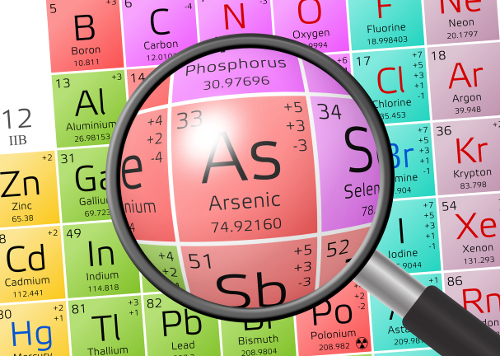 Arsenic also has been known for therapeutic uses for over 2,400 years as well. For instance, arsenic trioxide has been known to stop or slow cancer cell growth in the treatment of acute promyelocytic leukemia and other cancers. There are randomized clinical trials that show arsenic could potentially help send cancer into remission, and work as a blood thinner. As a result, the FDA (Food and Drug Administration) approved arsenic trioxide for refractory or relapsed acute promyelocytic leukemia in 2000, according to the journal The Oncologist. In 1910, a German scientist and physician Paul Ehrlich would develop an organic arsenical for the treatment of trypanosomiasis and syphilis. Interestingly enough, arsenicum album will alleviate the symptoms that are induced from the mineral arsenic. Homeopathy founder Dr. Samuel Hahnemann proved the effectiveness of arsenicum album and featured it in his Materia Medica Pura (1821-1834). A seemingly countless amount of scientific evidence has found that homeopathic arsenicum album can reduce effects of arsenic poisoning. Take a study published in the journal BMC Complementary and Alternative Medicine in 2003. The research would suggest that both homeopathic arsenicum album 30C and arsenicum album 200C decreased the liver damage caused from arsenic-induced poisoning in mice. Another study published in the Journal of Chinese Integrative Medicine in 2012 found that arsenicum album 30C would improve arsenic toxicity and damage in sodium arsenite-induced toxicity in Escherichia coli. Other studies show that arsenicum album 30C can improve responses in yeast (Saccharomyces cerevisiae) exposed to arsenic. One note of caution, however, is the antibiotic actinomycin-D (AMD) has potential to decrease the protective efficacy of arsenicum album 30C and arsenicum album 200C against arsenic poisoning. Arsenicum album is also the remedy of choice in detoxification programs for the chronic and acute effects of alcohol, drugs, vaccinations, and food poisoning. Some of the effects arsenicum album could help remedy include shortness of breath, extreme anxiety, restlessness, skin reactions, burning pains, and great thirst. It is also used for food poisoning from bad fish or meat, canned food, fruits, ice cream, and old cheese. There may also be violent burning pains in the stomach, diarrhea, and exhaustion. Arsenicum album also antidotes toxicity, septic conditions, and the poisonous effects of vaccines, especially when there are boils, ulcers, or abscesses at the site where the vaccine was given. In homeopathic medicine, the remedy profile is a significant indicator for determining whether arsenicum album is the best fit for your symptoms. The people most suited for arsenicum album are affectionate, sensitive, and stable in good health, while they are also prone to stress, restlessness, and anxiety about their health. They also have a deep need for reassurance. An illness will also bring rapid mental and physical exhaustion and chaos, which heightens their vulnerability and fears, and can cause pessimism or severe anxiety. The person will also be a perfectionist by nature, and when they are under stress or ill, they may develop obsessions or phobias, such as about cleanliness. They also desire warm drinks, alcohol, and sour, sweet, warm, and fatty foods. Besides arsenic poisoning, arsenicum album is also prescribed for frequent colds, sore throats, circulation disorders, fatigue and exhaustion, fevers, herpes, neuralgia, sleeplessness, restless legs syndrome, Raynaud’s disease (adrenal condition), malaria, and mouth ulcers. Let’s take a quick look at other health benefits of arsenicum album. The following is how the remedy benefits digestive disorders, anxiety and depression, respiratory illnesses, headaches, skin conditions, and kidney conditions. Arsenicum album is known to treat various digestive disorders and complaints such as diarrhea, indigestion, gas, bloating, cramps, gastroenteritis, stomach ulcers, vomiting, and motion sickness. Arsenicum album is useful for diarrhea, gas, indigestion, and other digestive symptoms when it is accompanied by exhaustion, restlessness, and anxiety. The person who requires arsenicum album will feel pain in the digestive tract, while they will also frequently desire water or tea. The person’s stool may be watery and foul smelling. Conditions for this remedy are often worse around midnight and in the morning. Alcohol, bad meat or other spoiled food, fruit, ice cream, cheese, cold drink or food, are other substances that make the person’s symptoms worse. Arsenicum album is a common remedy your homeopath may prescribe for anxiety or depression. Shortness of breath, selfishness, nervousness, and restlessness are common symptoms when it comes to anxiety and arsenicum album. The person will often be concerned with security and order, and they may be obsessive concerning small details. Panic attacks may also be common around midnight and early morning. Digestive issues and asthma may also accompany the anxiety symptoms. The person may also fear death, tight spaces, and robbers, and may feel anguish toward family members. This remedy is indicative of people with depression, especially when anxiousness, insecurity, and perfectionism are also prevalent. Materialism may also be a concern with this person. When sick, the person may exhibit signs of dependence and suspicion. Arsenicum album may also be useful for postpartum depression. Arsenicum album could treat asthma and other breathing conditions such as emphysema. The person who requires this remedy would experience shortness of breath, wheezing, cold sweats, and a blue complexion. Arseniucm would be an appropriate remedy for asthma when a person feels exhaustion, anxiousness, and restlessness. Lying down will often make breathing problems worse. Asthma issues will be very intense between midnight and 2 a.m. The person will often feel better with heat, coffee, and sitting up, especially when the person has emphysema. Symptoms are also worse from coughing, alcohol, lying on the back, dampness, the outdoors, and the cold. In a clinical study review published in Immunology and Homeopathy in 2006, arsenicum album was found to be the most frequently used remedy for bronchial asthma. There was a significant reduction in the frequency and severity before and after the use of arsenicum album. Arsenicum album is known to treat a variety of skin conditions such as eczema, psoriasis, mumps, cold sores, herpes, hives, burns, shingles, and chemical or food allergies and sensitivities. The remedy is recommended for people who have dry, itchy, and burning skin, especially with eczema. Heat makes the condition better, and scratching makes it worse. The remedy is also necessary for psoriasis when the person experiences red patches with large grayish-white scaling. The person may also be obsessive, insecure, and anxious. Arsenicum album may also be also effective for people who are very sensitive to a variety of substances and foods. In a clinical verification report in Homeopathy: the Journal of the Faculty of Homeopathy published in 2013, arsenicum album was considered the most effective homeopathic remedy for hay fever, which is an allergic condition caused by dust or pollen. Arsenicum album is used for headaches when the pain begins at the bridge of the nose and extends over the entire head. Other symptoms will include nausea, vomiting, and dizziness, while anxiety, stress, and excitement may aggravate the headaches. Symptoms may improve from cold air or cold compresses, and symptoms worsen from tobacco smoke or the smell of food. Arsenicum album is a useful homeopathic remedy for kidney inflammation, water retention, and swelling of the entire body. There is also burning urination and weakness in the abdomen after urination. Other problems will include kidney abscesses, urine retention, diabetes, and uremia—a condition associated with electrolyte, fluid, metabolic abnormalities, and hormonal imbalances. Warm rooms or drinks will improve symptoms, while they worsen from cold and dampness. Where do you find homeopathic arsenicum album? You can find it online or at your local health food store in liquid or pellet form. The remedy can also be acquired from your homeopath, if they determine that arsenicum album is right for you based on your mental, emotional, and physical symptom picture. In general, the best dosage of arsenicum album is one pellet or five liquid drops every 30 minutes for intense symptoms or every four hours for mild symptoms. After there is improvement, stop taking the remedy, and only continue the remedy once symptoms have returned. If there is no improvement after three doses, contact your homeopath. They may choose a different remedy or dosage for chronic or persistent symptoms. As mentioned, homeopathic arsenicum album is beneficial for arsenic poisoning and other forms of detoxification, as well as digestive disorders, anxiety and depression, respiratory illness, kidney conditions, headaches, and skin conditions. “Homeopathy Arsenicum,” herbs2000.com; http://www.herbs2000.com/homeopathy/arsenicum.htm, last accessed June 29, 2017. “Know Your Remedies: Arsenicum album (Ars. ),” Homeopathy Plus; http://homeopathyplus.com/know-your-remedies-arsenicum-album-ars/, last accessed June 29, 2017. “Arsenic Remedy For Arsenic Poisoning? Homeopathic Solutions For A Global Catastrophe,” ScienceDaily, Oct. 22, 2003; https://www.sciencedaily.com/releases/2003/10/031022061728.htm. Banerjee, P., et al., “A potentized homeopathic drug, Arsenicum Ablum 200, can ameliorate genotoxicity induced by repeated injections of arsenic trioxide in mice,” Journal of Veterinary Medicine, September 2007; 54(7): 370-376. https://www.ncbi.nlm.nih.gov/pubmed/17718811. De. A., et al., “Potentiated homeopathic drug Arsenicum Album 30C inhibits intracellular reactive oxygen species generation and upregulates expression of arsenic resistance gene in arsenite-exposed bacteria Escherichia coli,” Journal of Chinese Integrative Medicine, February 2012; 10(2): 210-227. https://www.ncbi.nlm.nih.gov/pubmed/22313889. Das, D., et al., “Potentized homeopathic drug Arsenicum Album 30C positively modulates protein biomarkers and gene expressions in Saccharomyces cereviasae exposed to arsenate,” Journal of Chinese Integrative Medicine, July 2011; 9(7): 752-760. https://www.ncbi.nlm.nih.gov/pubmed/21749826. Datta, S., et al., “Efficacy of a potentized homeopathic drug (arsenicum Album-30) in reducing genotoxic effects produced by arsenic trioxide in mice: comparative studies of pre-, post- and combined pre- and post-oral administration and comparative efficacy of two microdoses,” Complementary Therapies in Medicine, June 1999; 7(2): 62-75. https://www.ncbi.nlm.nih.gov/pubmed/10444909. Datta, S., et al., “Efficacy of a potentized homeopathic drug (Arsenicum-30) in reducing genotoxic effects produced by arsenic trioxide in mice: II. Comparative efficacy of an antibiotic, actinomycin D alone and in combination with either of two microdoses,” Complementary Therapies in Medicine, September 1999; 7(3): 156-163. https://www.ncbi.nlm.nih.gov/pubmed/10581825.